But Do It Yourself projects? Uh, no. I didn’t even know what studs were until I met Andy. (Yes, ha, and yes, true.) DIY scares me, probably because my father’s efforts at anything beyond caulking involved profanity and fears of an untimely death. In Dad’s defense, though, any DIY project such as cementing the bannister back down undoubtedly had to be undertaken because of child-related mayhem. But my husband? Very handy, thanks to years as an unpaid laborer for his father. As Andy says, “My dad taught me how NOT to do everything.” Besides, why would Jay pay for help when he could save money and do it himself (translation: have Andy do it)? Contractors were only hired after Andy left home. Every time we visit Andy’s parents, though, Jay puts Andy to work. After we married, Andy and I moved to a house built in the 50s and remodeled in the 70s. The main bathroom had puke-green walls. A cheap vanity and a glorified plywood box holding recessed lights over the sink added to the cave-like quality of the room. Andy dragged me off to Home Depot. We picked out a new toilet, a pedestal sink, and a cabinet. The salesperson asked if we wanted their certified plumbers to handle the installation. I said yes. “Even though they cost a fortune,” Andy muttered. “Cheaper than a divorce,” I muttered back. Andy cheered up when we picked out a sledgehammer. (I didn’t ask what he visualized swinging at.) He bought a cement board, tiles, and grout — after I’d approved the colors. We got drywall patching stuff, a tile cutter, and a bunch of other thingies. And then we got to work. Well, Andy got to work. Our bathroom really only has room for one. He spent hours removing the toilet and vanity. Then he sat in the mess and drank a beer. Andy believes in pacing himself. I do not. Show me a project and all I see is the finish line. There is no food, no drink, no nothing until the work is done. Also, I was in a terrible mood because a) my college football team was losing a game and b) clearly Andy had underestimated how long the project would take. So I picked up the sledgehammer and beat the crap out of the lightbox. Very therapeutic. Even though Andy made me stop and put on safety goggles. Then we tore up the floor. (Well, Andy tore it up. I mostly carried debris to the trash.) All that was left were the wooden boards above the crawl space. And there were spaces between the boards. Huge ones. “Black widows could fit through those EASILY,” I informed Andy. When I came back, Andy had cut a piece of plywood and put it in as a temporary floor. He never admitted the black widows had come calling, but I know. I know. The plumbers came and redid the plumbing. Andy fitted the cement board and worked on the dry wall repairs. Andy began spacing tiles. I took over, inserting whimsical fish tiles in with the plain cream ones to spice up the bathroom. Andy grouted. He refused to let me help. I picked out paint. We repainted. Andy cut baseboards. I painted those. Our boxes with the cabinet, the toilet, and the sick arrived. The plumber returned to complete the installation. An hour later, Home Depot promised that the tank would be arriving in two days. I unpacked the other boxes, and discovered that the bottom portion of the cabinet – the part with legs and feet – was also missing. I called Home Depot again. I may have had a bit of a tantrum. They promised the legs would arrive in a week. The cabinet piece showed up in two days. The toilet tank? A week. And the plumbers couldn’t return until a week after that. “And I would have been able to drink craft beer because we’d have saved money…” Then he stopped talking. Cuz he likes being married. At least the floor was done and we could shower spider-free. 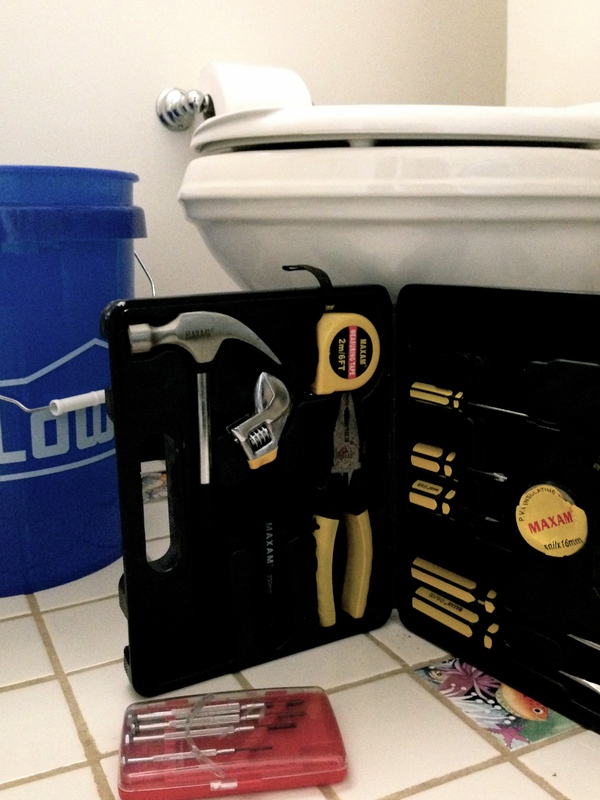 The plumber was equally professional, and our new sink and toilet were soon installed and gleaming. The plumber handed me his business card when he left. He said I could call him if we had any trouble, since his work was guaranteed for a year. I could also call him if we had any other plumbing issues. He did a good job. I never had to call him about the bathroom. But several months later, the pipe broke under the kitchen sink. It actually took TWO trips to Home Depot, but Andy fixed the pipe. With a lot of profanity. It is! Back when I rented, I called the landlord. Now it’s an ongoing battle against entropy and the forces of nature. And inimical canine forces. My husband is very handy. He can do most things including toilets but he doesn’t like plumbing. He will gladly contract that out. I redid a bath once. It was the only one I had and it took a full week. I wanted a specific tub and vanity mirror. I wanted to pre-order and have it before the job started. The contractor said not to worry they PROBABLY were in stock. They weren’t. I had to pick something else. As for the mirror he picked out something I hated while I was at work. Had to move but the bathroom looked great (except for the mirror). When it’s supposed to be in stock it never is! It’s good to have a husband who knows his limitations. Do you find owning a house to be worse than renting one? IS my theme still purple? I used some pictures of flowers for background. Maybe I should change it up for summer. I do like owning a house and being able to do whatever I want with it. You know, typical control freak. I like having flower beds and I love my yard except now when it is too hot to go outside. Then I wish I had the apartment with central AC. We just bought our first home and I swear one of us is at HD at least twice a week. Pre-marital counseling should involve some sort of discussion on what kind of impact DIY projects and HGTV can have on a couple during the first year of marriage. An excellent point! We had to do premarital counseling in order to qualify for a religious ceremony, and there was no discussion of home improvement. Ministers need to up their game. Less talk about kids. More talk about sledgehammers. Was Andy ok doing premarital counseling? Let’s just say my dad is a crazy Catholic and Richard just popped a question, so this might be something I need tips on! As a fellow white woman joining a Chinese family (ach!!) and planning a wedding, I will need your almighty wisdom. OMG!!!! SQUEAL TO THE ROOFTOPS! Richard proposed! Congratulations and confetti and ALL THE CELEBRATORY THINGS! My advice is, as always, to NOT do everything I did. Actually, you are way, way, ahead of me, and it will be clear sailing for you because you already researched the culture and nothing will take you by surprise. Dang Andy is super helpful!!! Who knew that putting your son to work would create the ultimate handyman. I’m not very DIY either, but like Andy, my boyfriend doesn’t want to spend money unless it’s absolutely necessary… which has forced him to pick up a lot of handyman skill sets. Very useful! And wow, I want to sledgehammer stuff. That sounds fun! Men kill me. I mean, given how much money Andy makes an hour, does it REALLY make sense for him to spend three hours shaving and bathing a dog? IT DOES NOT. Plumbers, though…plumbers are expensive. He might have a point on plumbers. I wouldn’t be surprised if people called him Handy Andy 😀 No matter the profanities – he managed to get the plumbing fixed in the kitchen. And I hope the plumbing still stands today in the bathroom and nothing went wrong. But if it did, I’m sure Andy could have held his own. I’ve never had my own home before, but I look forward to it and all the DIY, both big and small, that comes with it. As Andy said, there is YouTube.. Nothing went wrong with the bathroom’s plumbing. The main line to the sewer, though? Something went quite wrong. But that’s another post. Bedding! How did I forget that? You’re absolutely right. It’s essential. Wow, Andy is so pro! Here hiring people to do it is so cheap that doing it yourself is really too much trouble. However the results are not exactly ideal. The cold water in my bathroom tap comes out when you turn the knob to the left, although the knob is red in that side (so, should be hot). We hired a plumber once who combined swearing with praying. He was all — “Jesus, Mary, and Joseph!” He considered it a form of praying too. My dad was a carpenter, so, yes, I knew how to do a few things. He even let me use his big skill saw a few times. Mostly, though, I did painting, varnishing, and sanding. 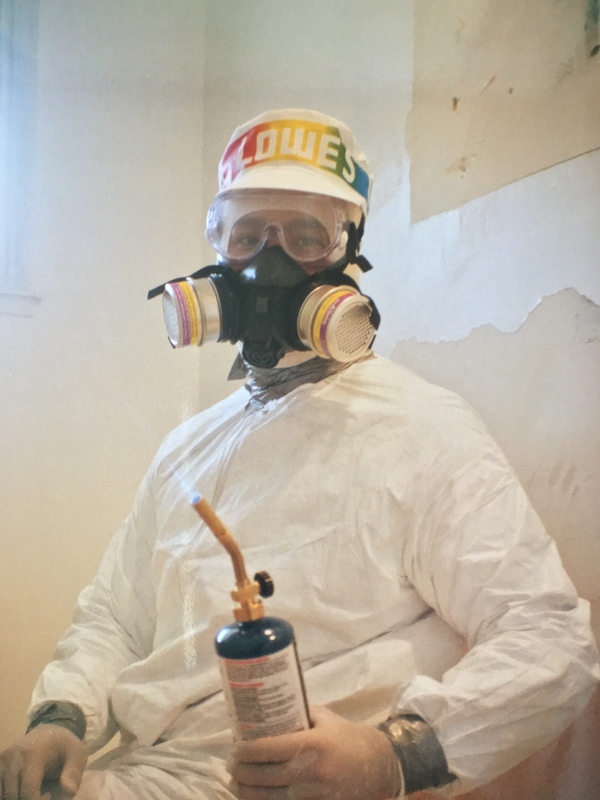 One of my summer jobs was to paint the trim on our two-story house. I’m surprised he let me do it because he was so safety conscious. My husband was another of those unusual DIY Chinese guys. He would try anything. We did a lot of remodeling when we moved back to the States. The only problem: Because of my dad, I knew what perfect looked like. Now I just hire a professional. LOL over your poor husband, with a wife who has a critical eye. Did he ever make anything that was perfect, or did you just learn to bite your tongue? Mostly I bit my tongue. He was pretty handy, but … you know, not as good as my dad. When there was something I cared about and knew it would be hard to accomplish, I suggested hiring someone. And was he okay with that? Andy haaaaaates spending the money. If I didn’t interrupt his fun too often. I think that competence — in whatever form it takes — is exceptionally attractive. But unless you work with your spouse, you don’t always get to see them being competent. If a guy is handy on the stove or replacing window screens, it’s instantly visible. And so very hot. Just like the folding of the laundry or the cleaning of the bathroom would be. If I saw that. The fountain is an elephant mother holding an elephant baby. I need a better camera! Yes, that is the fear that all owners face when they rent. A house trashed. Ugh. I hope you kept their security deposit!